Tony Lawrence's Coins & Stuff: The U.S. Shield Nickel - the ugliest coin ever made? The U.S. Shield Nickel - the ugliest coin ever made? The story of the first U.S. five cent nickel coin includes corruption and politics, money supply and hoarding. Add to that the fact that even one of the people most in favor of its production called its reverse design "a tombstone surmounted by a cross and overhung by weeping willows". A well known publication for coin collectors described it as "the ugliest of all known coins". Parts of the American public had other reasons to dislike it too: some thought the original reverse design was reminiscent of the Confederate “Stars and Bars” flag. As the first issue of this coin was in 1866, and the U.S. Civil War had only ended in 1865, it is easy to see how emotions would still be raw over that issue. The really important distinction for this coinage was that it was among the first denominations other than the one cent coin to not be made of precious metal. We'd had half dimes since the very beginning of the mint, but they were silver. A three cent nickel coin had been minted in 1865; the success of that encouraged the mint to try a nickel five cent coin. They were also being "encouraged" by a wealthy and influential individual who happened to own nickel mines. There was real justification for getting away from silver coins - these were being hoarded and there was a damaging shortage of small change in the economy. Naturally, Joseph Wharton (the man with the nickel mines) wanted the mint to use more nickel than copper, but there were problems with that desire. Nickel is hard. That's why we use it in armor plating. 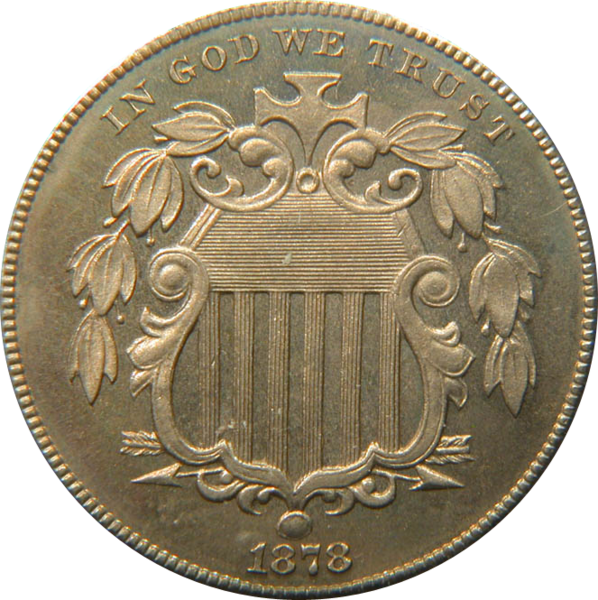 Striking nickel coins is difficult, as the mint had already learned in 1857 with the Flying Eagle Cent. That coin was only 12% nickel, these three and five cent nickel coins were specified to be 25% nickel, which would make them that much harder. The design made a bad situation even worse. With coinage, you want to avoid lining up raised areas front and back. An ideal coin (for ease of minting) would be one in which any raised part would have blank space on its opposite side. Of course that can't be perfectly achieved in practice, but this nickel design had a big raised area on the obverse and quite a lot of metal to bring up on the opposite side. Combined with harder metal, this meant the coins had to be stamped multiple times. That meant slower production and more die damage, costing the mint money and decreasing the expected volume. The reverse was redesigned to make minting easier, but troubles still plagued these coins. Numismatic Guaranty Corporation says that "more dies were broken striking Shield nickels than all other denominations added together". These difficulties also mean that well struck examples are more rare and command premium prices. So called "full shield" nickels can be worth much, much more than their less fully detailed brethren. It may sound odd to counterfeit a nickel, but because of coin shortages and the fact that a nickel in 1866 had purchasing power close to a dollar today, there was reason to attempt it. A merchant desperate for small change might have welcomed a visit from someone who could solve that problem quickly and at less expense than going to his bank. The counterfeiters would have the same problems the mint had with nickel. If they used much less to make striking easier, the color would have been off. If they substituted something softer, the weight would be wrong. If they used the same mix, their dies would would suffer just as the mint's did, so they would have to compensate in other ways and these counterfeits show their difficulties. "Not worth a plugged nickel" was a common expression for worthless things in my youth. It probably came from the practice of drilling out the center of silver coins and replacing what was removed with base metal. What silver remained in a dime or other silver coin would still have value, but a plugged nickel, being worth little in metallic value to start with, would be truly worthless (and not worth plugging, of course). Nickels and other coins often are found with holes that were used to string them as jewelry. I would have thought that a coin this unattractive would escape that treatment, but I have seen many "holed" nickels, so that may also serve to explain the phrase. Although these nickels didn't exist until hostilities had ceased, this article explains the somewhat macabre use of coins as body tags in the Civil war. This coin has an interesting connection with attempts to switch the U.S. to the metric system. Congress had authorized the use of the metric system in 1866 and those who supported that wanted the coin to have its weight specified in grams. It actually does weigh 5 grams, but the Coinage Committee didn't quite dare make that specification, so they fixed its weight at 77.16 grains (which is 5 grams). I only can recall finding one shield nickel as a child in the early 1950's and that was extremely worn. Early mintages were high in spite of the Mint's troubles with dies. There are some prohibitively scarce dates later in the series, though, making a collection by date difficult for those of us who are not wealthy.